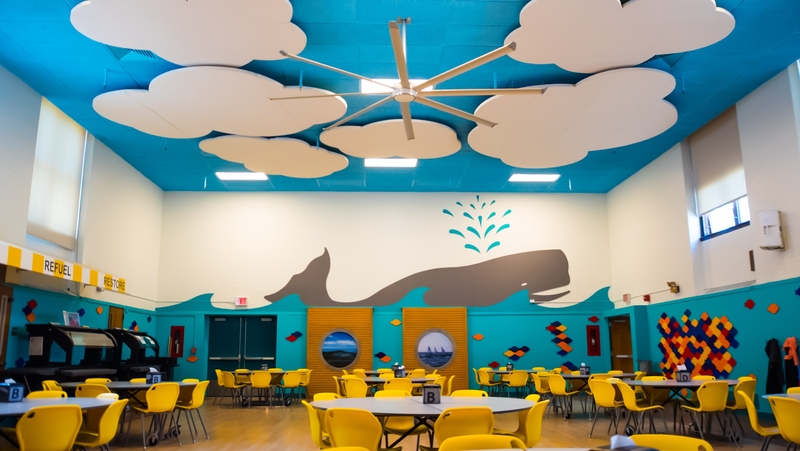 An outdated multipurpose room at Rowayton Elementary School was transformed into a full-time cafeteria with a custom acoustic solution that stands out as a key design element. From a young age, kids quickly become familiar with the phrase “use your inside voice.” However, education professionals occasionally need a little extra help when it comes to controlling noise in one of the loudest spaces in an elementary school — the cafeteria. Poor acoustics from hard surfaces and tall ceilings, as well as excess noise from active, little learners can negatively affect the sound quality and understanding of speech in the classroom, library, and in the cafeteria. Such was the case at Rowayton Elementary School located in Norwalk, Connecticut. The school tapped Antinozzi Associates to transform their outdated multipurpose room(formerly a gym and cafeteria) into a full time cafeteria. With a focus on noise control, the design team led by project lead and interior designer, Lauren Williams, sought to find a solution that not only helped with noise, but one that could also be used as a key design element. The design team incorporated custom-cut acoustic panels to improve sound control within the cafeteria. “The overall theme was to highlight the location of Rowayton as being part of the Connecticut shoreline, making the space nautical and fun for elementary students,” explained Williams. “While working closely with the PTA and school principals, we came up with the idea of the ocean breaking with the whale rising above, as well as the fish below,” added Williams. The portholes shown throughout the space are interchangeable photographs taken by a local photographer and parent at the school. The large acoustical clouds on the ceiling are used to mimic the sky. Kirei specifically crafted the water and the whale from EchoPanel. The whale itself consists of seven individual pieces that were installed to appear as one on the upper half of the back wall. The whale is approximately 40 feet in length and 11 feet tall. Additionally, several custom-cut pieces mimic ocean waves to complement the aquatic theme. Ultimately, the whale improves the cafeteria’s acoustics and complements the overall design, which highlights the location of the school on the shore. “It was great to use an acoustical product within our price point for a design that large,” said Williams.